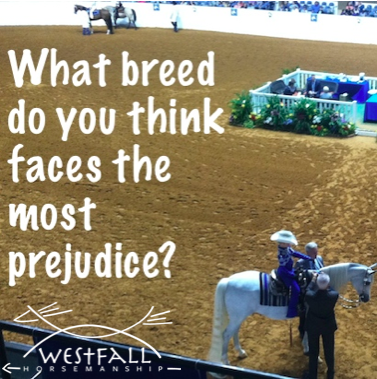 What breed of horse do you think faces the greatest prejudice? This is a very short question for a big subject. The shortest answer I can give you would be: I wouldn’t exclude OR include a horse purely on the breed. Sometimes the problem with really short questions is that it leaves more room for the reader to ‘read into’ the question. For example, in this question it would seem that Arabians are being put into the questionable category as far as safety for beginners. I have met Arabians that were the most gentle, kind and well trained horse that you could ask for. I have also seen some that were not for beginners. Is this because of the training? At least part of it is. Is it because that horse is naturally ‘hotter’…that could be true also. It is possible to find ‘hot’ horses in pretty much any breed…and in people too. Have you ever met a person who just had to be busy? Each horse and each person has their strengths and their weaknesses. Don’t let preconceived notions about what certain breeds are make your decision. Judge each one on his own merit. I once saw a draft horse that was ‘hot’ i.e.-prancy, excitable, etc. 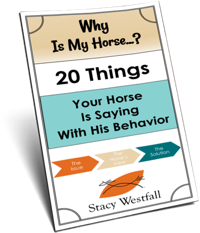 I wasn’t around the horse and owner for a long time, but it appeared that the horse was well cared for, trained and had no history of abuse or mistreatment. The owner said they had always owned the horse and they also said the horse had always been very perky. My brain had been trained to think that all draft horses were lazy….another preconceived notion. Sometimes these notions also lead to breed prejudice and that is NOT a good thing. Just think about all of the Thoroughbreds, Arabians and other breeds that people have preconceived notions about. What breeds do you think face the greatest prejudice? Do you think it is justified or unjustified? 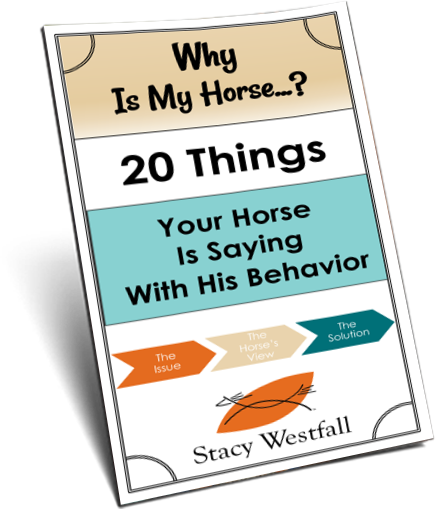 What is your happiest story about a horse that didn’t fit the standard preconceived notion about that breed? Appaloosas and haflingers! I hear that appy’s are stupid, lazy, stubborn, have terrible feet, poor attitudes etc. My 18 yr old appy (who I’ve had almost 10 years now…) is kind, sweet, in your pocket, easy going, and forward. He does have terrible feet though!! Haha. And a short tail. But he makes up for it being the horse I teach people who to lead, groom, handle ect. And he has a pretty head and neck! Lots of people tell me “Oh well, I don’t like appaloosas.” And I tell them to come meet Joe, and every single one of them has come to the dark side! Every horse is an individual, but the apps I’ve meet have all been awesome horses. I showed my trainers in hunters, and he cleaned up even though we weren’t another bay TB. As for haflingers, people say they can’t canter, they’re stubbon, lazy, only good for pulling, have terrible trots, untrustworthy. And…. then there’s mine. He’s easy, willing, level headed, unflappable, and he and I have done everything from Western Dressage, to hunters, to western pleasure, to gymkhana/barrels/poles and we’re always in the ribbons. Every judge with written tests have told me he’s “willing” or the “definition of willing”. Several have told me that in person. It’s all in the horse. There are bad apples in every breed, and sometimes they make people biased. I leased a 17hh saddlebred who was kind and sweet and mellow. Not normal adjectives for ASBs. I met a TB who tried to kill me, a quarter who tried to kill me, but it was just those horses. It all depends on the horse like it does with people!